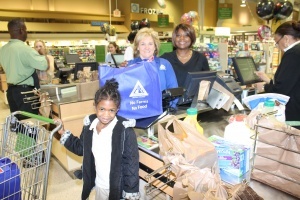 More than two dozen Duval County Farm Bureau volunteers greeted shoppers at the Publix store in Duval Station Centre in Jacksonville on Feb. 16. The Farm Bureau members sought to engage customers in conversations about the abundant, nutritious food supply provided by farm families across Florida and the nation. As a gesture toward sharing this bounty, they also paid the grocery bills for three very fortunate families at the store. “It is so exciting to go into the store and pick out these families and see the joy that it brings them,” said Bonnie Bailey, chair of the Duval County Farm Bureau Women’s Committee. “We just really like to get out there so people know there is more to Farm Bureau than insurance,” Bailey said. The volunteers also donated large stock of food valued at nearly $5,400 to the Northside Community Food Bank and a check for $1,500 to the Jacksonville Ronald McDonald House. These contributions follow a $25,000 donation to the Ronald McDonald House to pay for the construction of a room in the facility’s new addition. This local event, originally created nine years ago as a Food Check-Out Week activity highlighting the relatively low cost of food in the United States, has now become a larger community project.